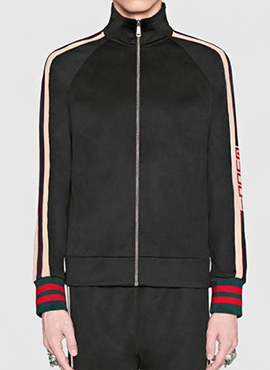 This is one of the signature G track pants. Relaxed-fit technical jersey lounge pants in black. Mid-rise. Three-pocket styling. Drawstring at elasticized waistband. Wool-blend logo tape knit in off-white, red, and navy at outseams. Rib knit cuffs striped in green and red. We uesed the high quality fabrics which had the same softness and thinness and it's a perfect fit for the trend.